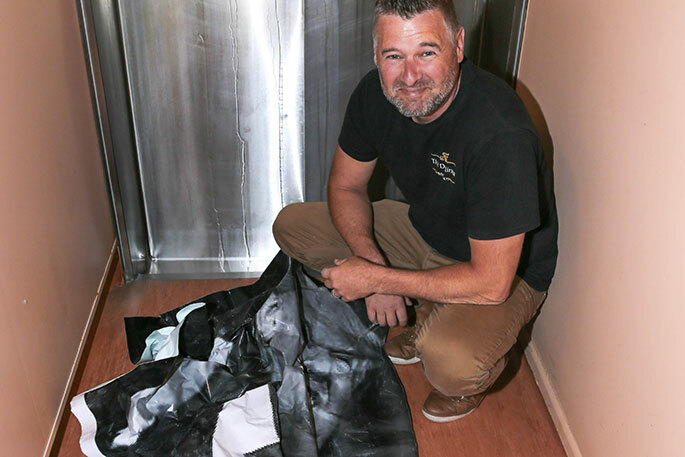 A decal on the wall of a urinal in a Methven pub became the centre of nationwide media attention at the weekend after it was vandalised on Friday night. The image, of US President Donald Trump, has taken pride and place in the men’s toilets at Methven’s Dubliner Irish Bar & Restaurant for the past two years and while drawing plenty of conversation during its tenure, it’s escaped relatively unscathed, apart from the obvious. But, on Friday night it was discovered that a patron at the pub had taken offence to the location of the image and ripped it off the urinal, discarding it in a nearby rubbish bin. Dubliner proprietor, Gary Manning, who runs the popular pub with his wife, Karen, took to social media to share the news of the vandalism in the hope of finding out who was responsible and within hours was fielding calls from almost every news outlet in New Zealand. “It went ballistic there for a while,” Manning said yesterday. The vandalism was reported to the local police who confirmed yesterday they had been made aware of the incident but could offer no further information. Manning however has done some sleuthing of his own and is reasonably certain he knows who is responsible. “We had two elderly American gentlemen in here on Friday night and one of them was seen acting a bit suspiciously around the toilet area. “I’ve since been able to find out that they are walking through the South Island and that they stayed the night at a local accommodation venue and were heard to be boasting in the supermarket about doing something at the Dubliner. “I’ve got a rather large Finnish lad who works for us and he’s offered to head down the bottom of the South Island and start walking back up in the hope of finding them. Manning said the decal was first introduced during the 2016 election campaign and had proved to be a popular item of interest for visitors. To find out whether or not it’s worth going forward and putting the image back up after the weekend’s mishap, the Mannings have gone to social media to find out whether or not it’s a worthwhile task. “It’s about $140 to replace it, the old one is in a pretty bad state, so we’re looking at a replacement, I think. As of yesterday, the poll on the Dubliner Facebook page showed an overwhelming percentage of support for seeing the decal returned to its former glory.